Making ravioli is easy when you don’t have to make the pasta. These beautiful little pillows are savory, delightfully sweet and very easy to make thanks to premade wonton wrappers. I used Pineapple Sage as I had a ton of it in my garden and I had no idea what to do with it… but regular fresh sage will be just as wonderful. Your efforts will not go without reward (these freeze VERY well and make about 4 dozen)… well worth the time to make them… and enjoy for a few months. 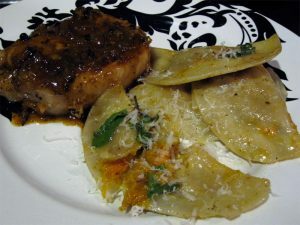 I served the ravioli as a side with an apple cider brined pork chop finished with a shallot cider pan sauce (recipe to come soon and may be the best thing I’ve come up with on the spot). These beauties would also be very impressive as an appetizer for the holidays. Note: Wonton wrappers are found in the freezer section of most grocery stores. Cut squash in half lengthwise and scrape out seeds. Season with salt and pepper. Place cut side down on a roasting pan. Scrub outside of sweet potato, pierce with fork in several places and place on roasting pan with acorn squash. Cook in the oven until very soft, about 1 hour. Let cool to room temperature and scoop out flesh into a large mixing bowl. Mash with sweet potato until well combined. Heat 2 tablespoons of butter in a saucepan over medium-low heat until it begins to brown. Immediately remove from heat and add remaining 1 tablespoon molasses and all the vinegar. Add to squash and sweet potato with crème fraiche, Parmesan, cinnamon, and nutmeg. Season, to taste, with salt and pepper and mix well. The recipe can be made ahead to this point. Cover well and refrigerate 4 hours or up to 2 days. To fill the raviolis: Put 1 tablespoon squash filling in the center of a wonton wrapper. Leave a 1/2-inch border all around the filling. Moisten borders with water and fold in half. Press all the air out and seal firmly by pressing all around with fingertips. Lay raviolis out to dry on a lightly floured board or baking sheet and lightly flour the tops. Repeat until you run out of wrappers and/or filling. To cook, boil in lightly salted water until tender, about 3 minutes. Reserve 2 ounces of the cooking water. On medium heat toss the cooked raviolis in the sage butter then transfer to a serving platter or dishes. Finish with a generous grating of Parmesan cheese.